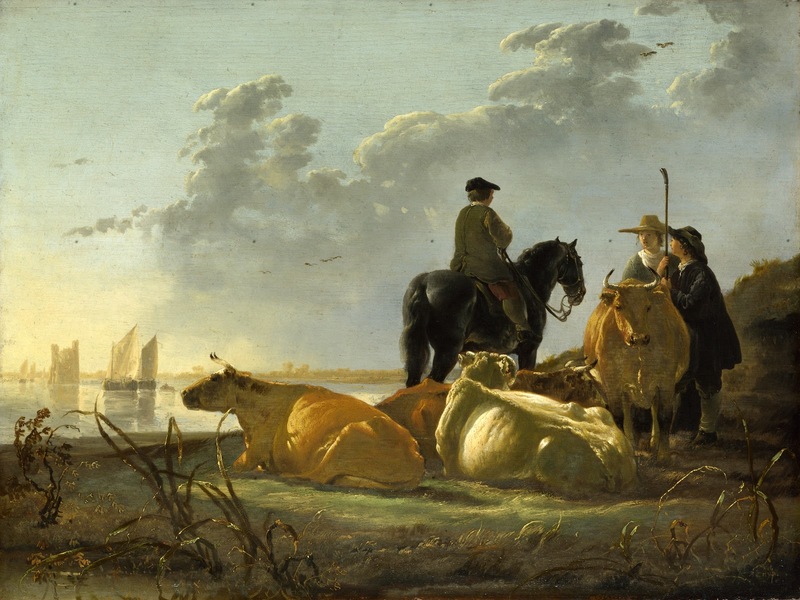 Aelbert Cuyp, in full Aelbert Jacobszoon Cuyp, Aelbert also spelled Albert, Cuyp also spelled Cuijp, (baptized October 20, 1620, Dordrecht, Netherlands - buried November 15, 1691, Dordrecht), Dutch painter** of the Baroque period** who is known for his peaceful landscapes of the Dutch countryside, distinguished for their poetic use of light and atmosphere. 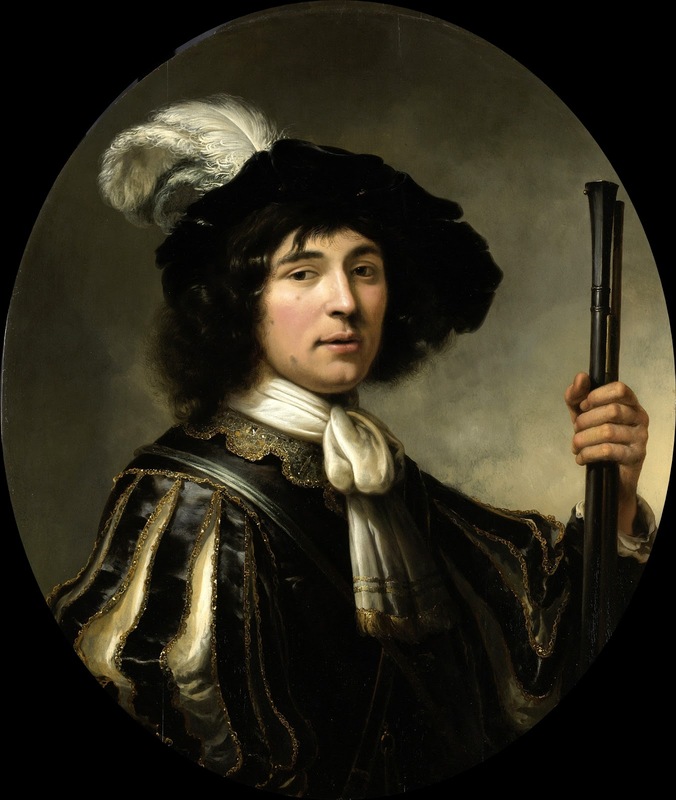 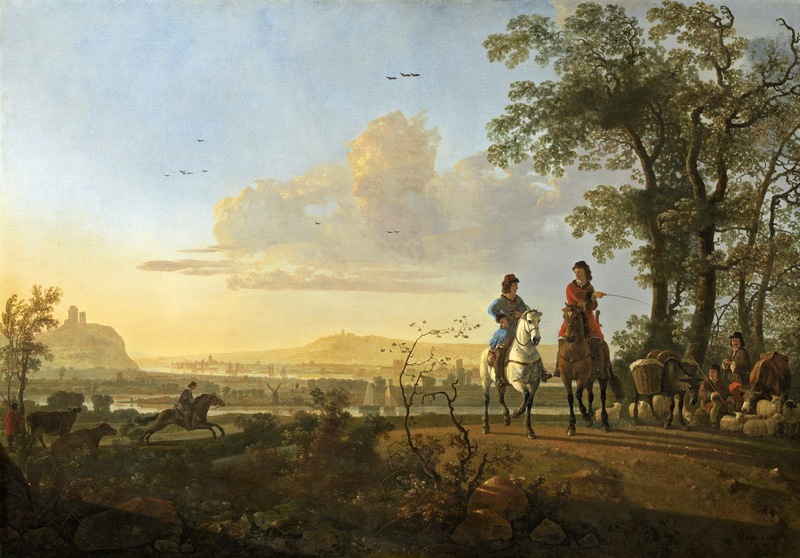 After the death of his father, portraitist Jacob Gerritszoon Cuyp, soon after 1651, and of his mother in 1654, Aelbert came into a considerable property and was a leading citizen of Dordrecht. 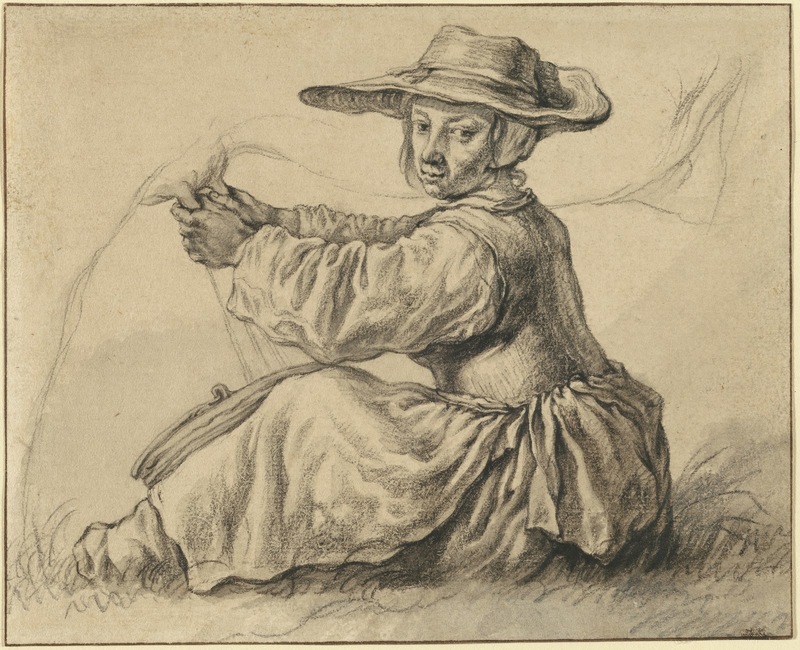 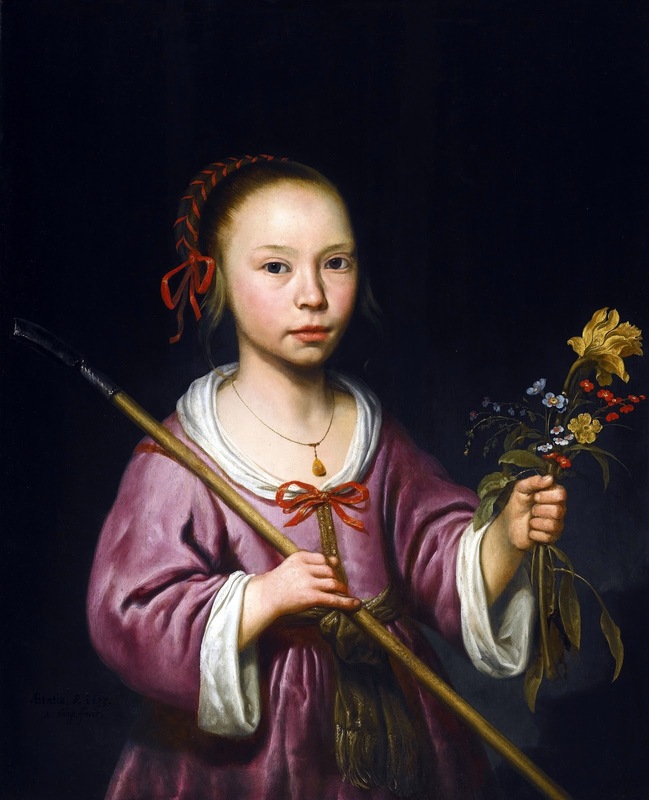 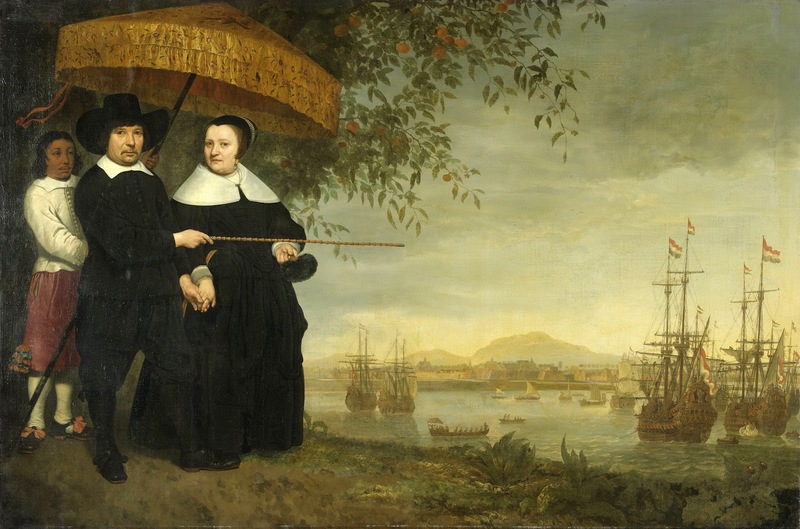 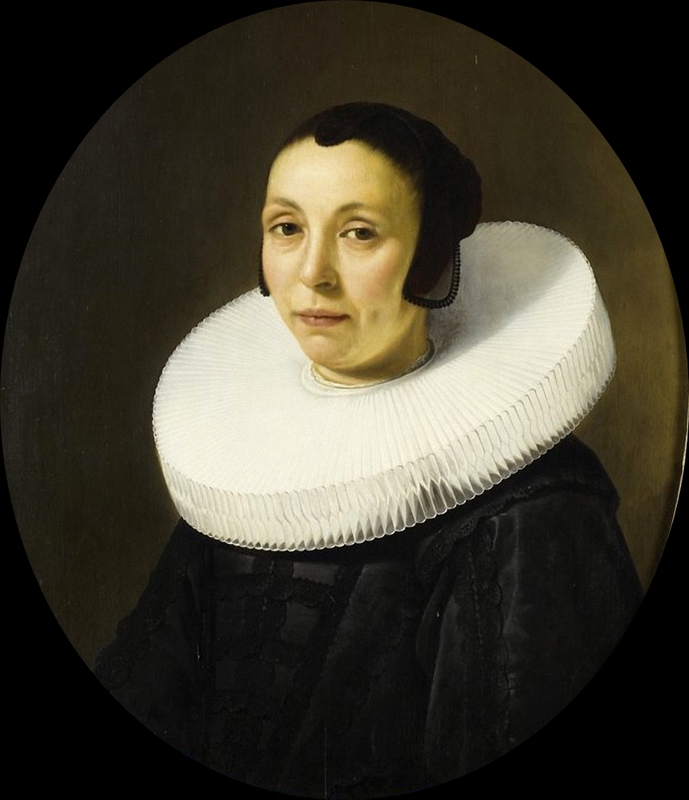 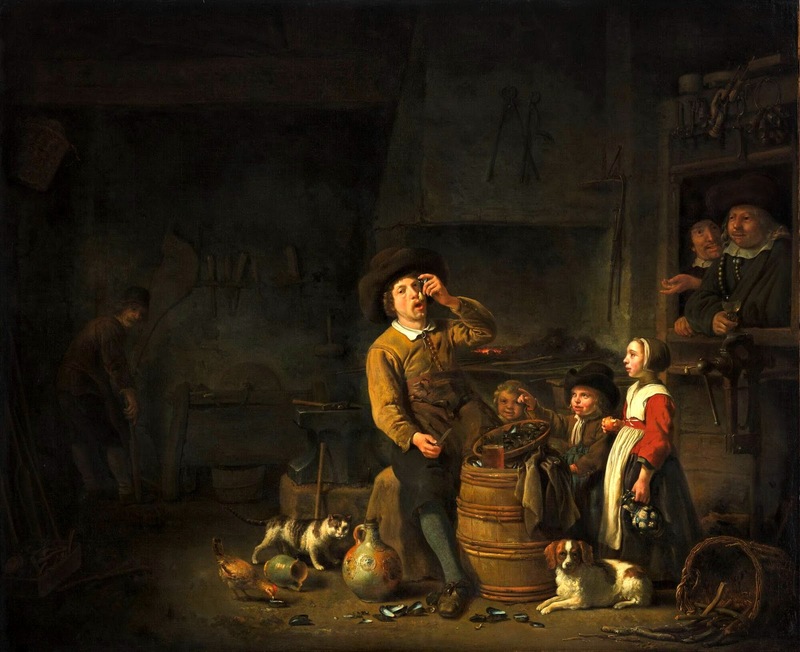 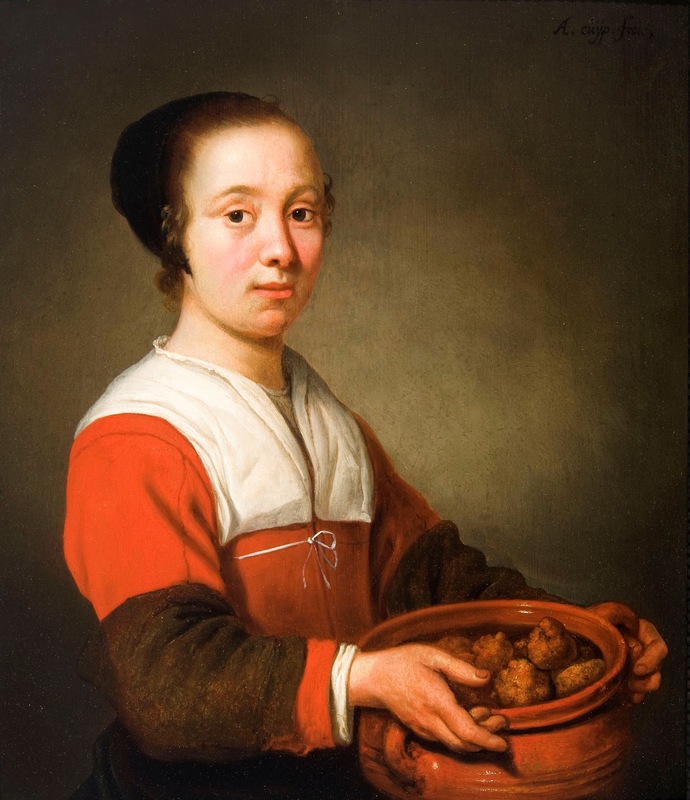 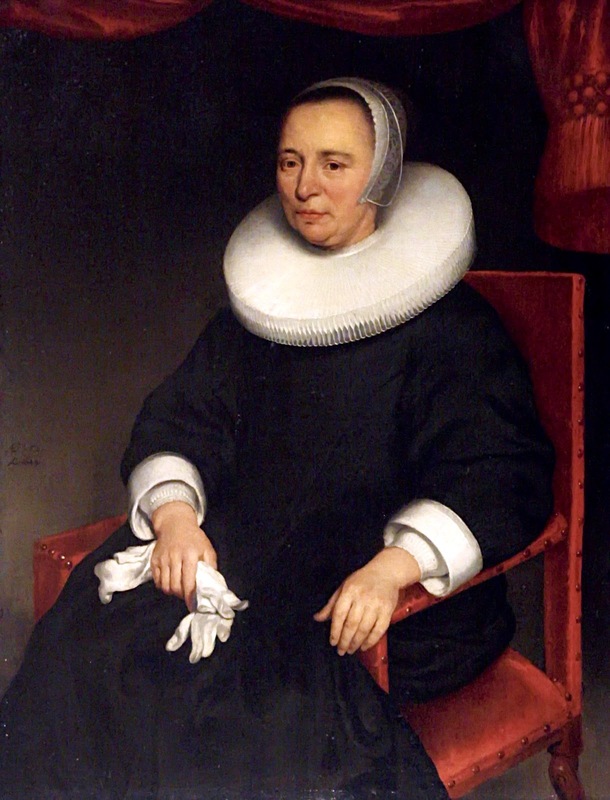 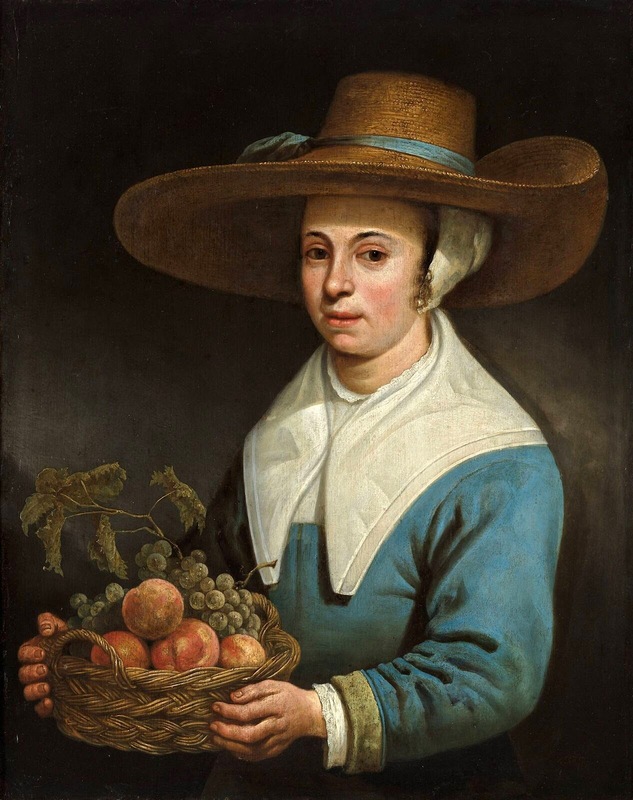 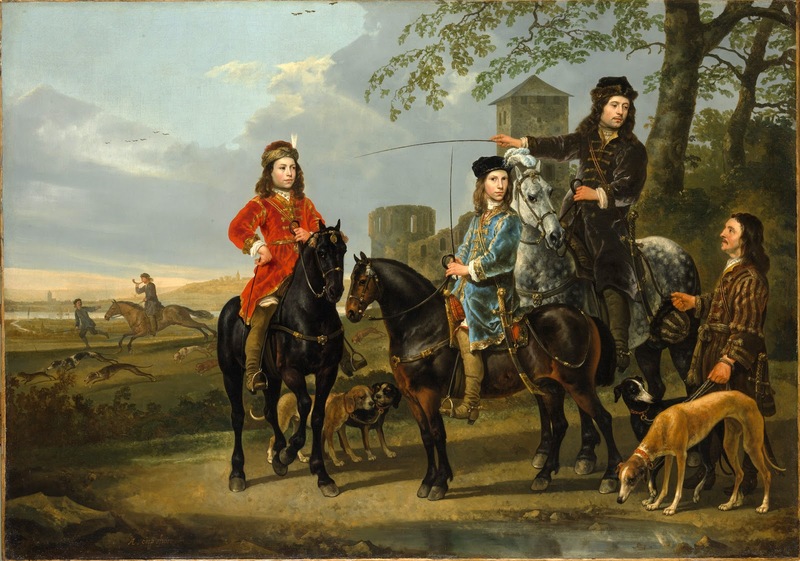 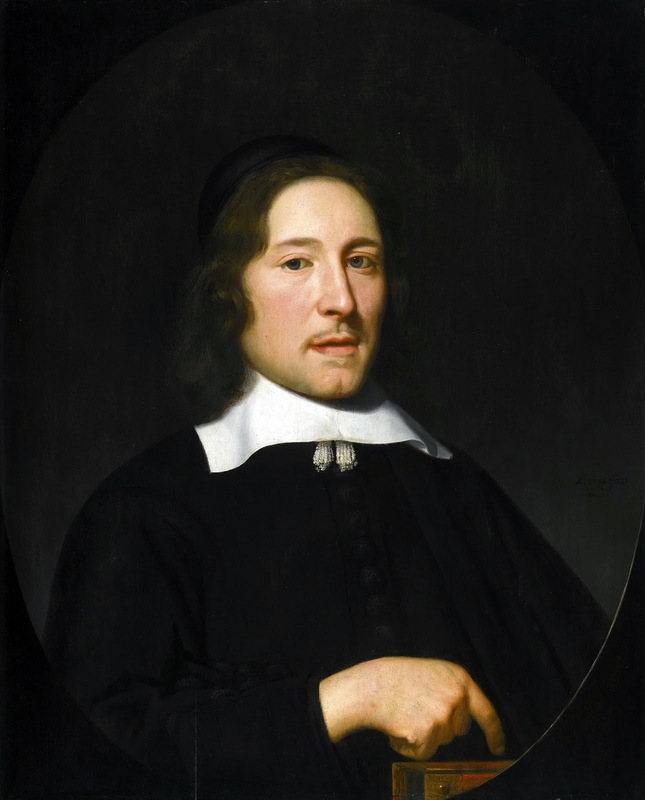 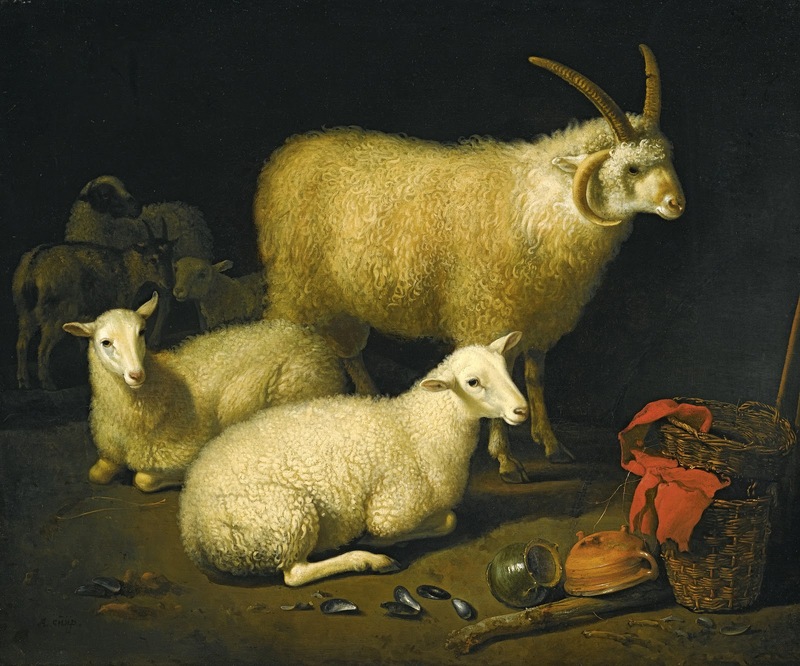 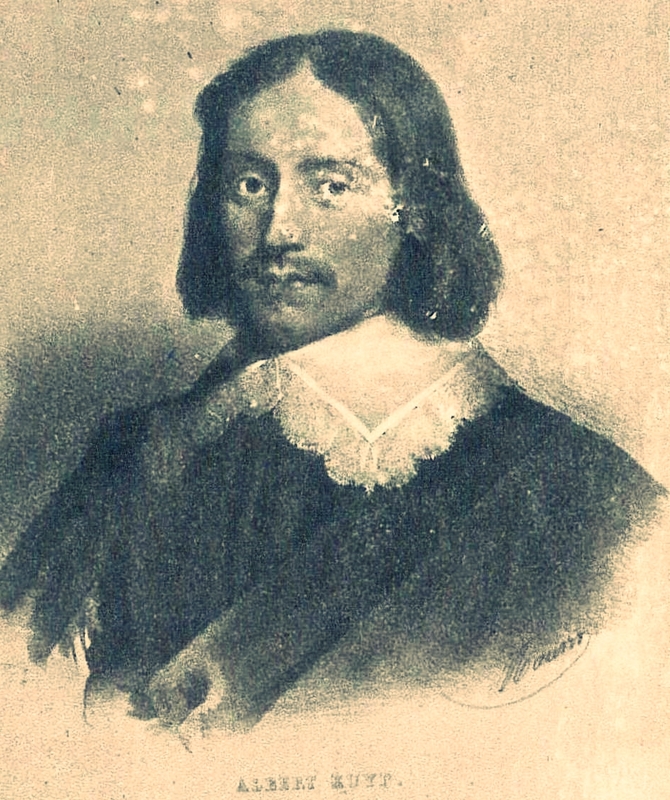 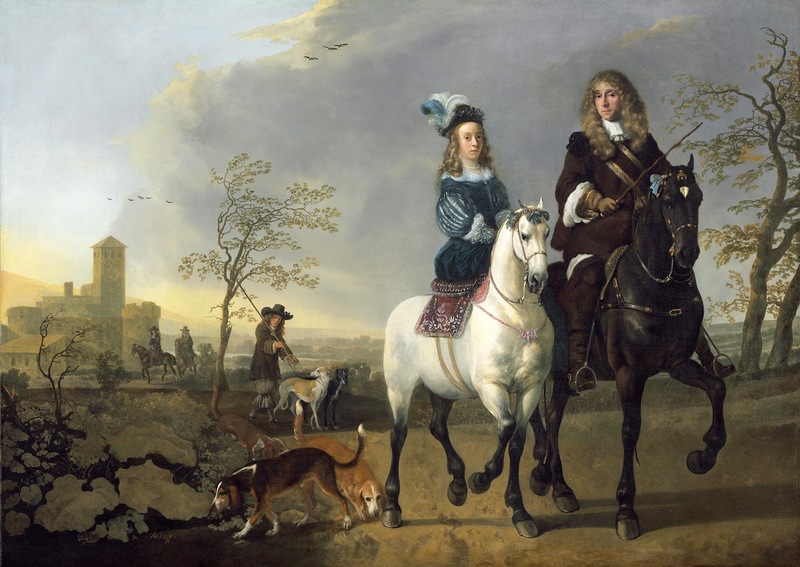 In 1658 he married Cornelia Boschman, a well-connected widow with three children, who in the following year bore him his only child, a daughter. 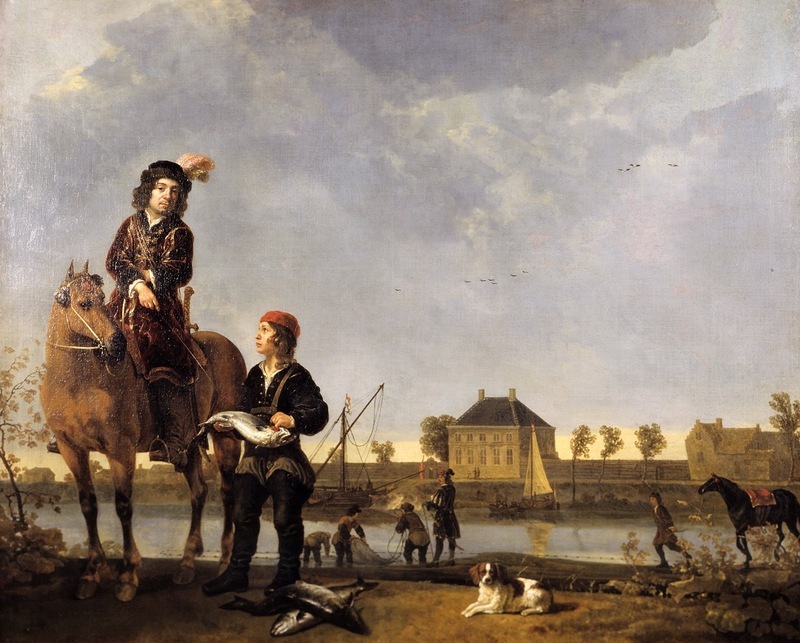 He sold his father’s house on the Nieubrugge in 1659 and, in 1663, moved into the house in the Wijnstraat, which he occupied, together with a property at Dordwijck, until shortly before his death. 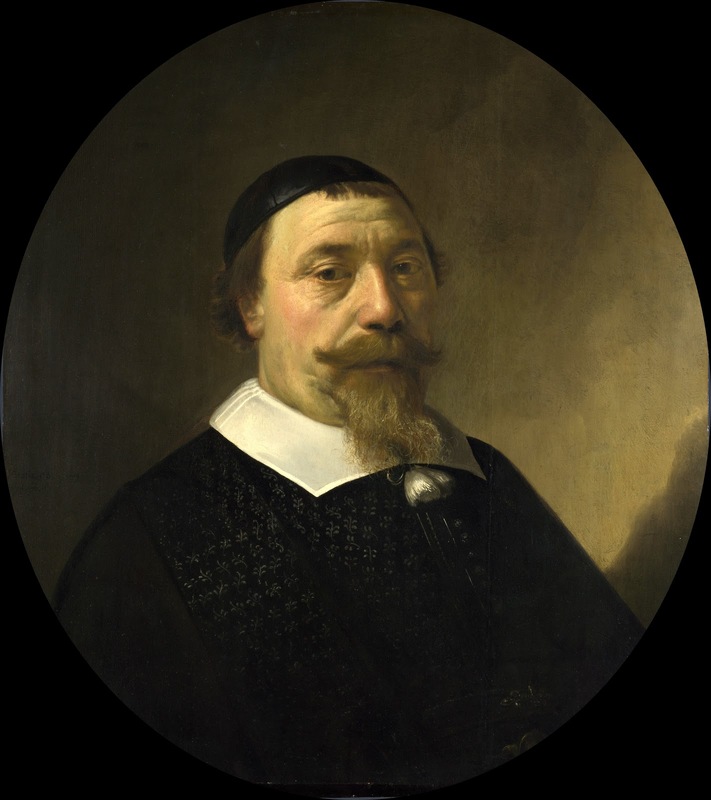 Apart from records of his name in the archives of Dordrecht, where he held a variety of civic offices, the known facts of his life are extremely sparse. 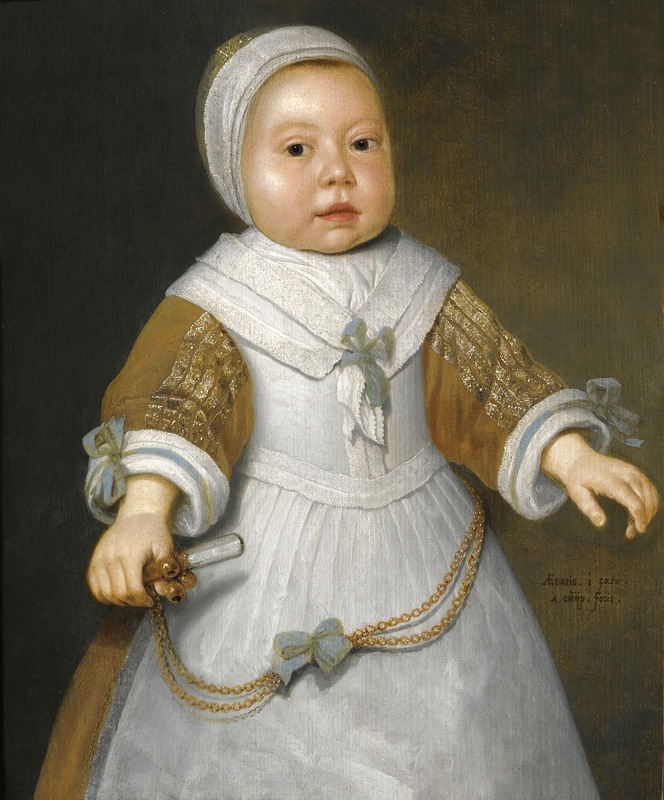 It is reasonable to suppose that he first studied under his father, whose influence is visible in both the style and the subject matter of his early works. 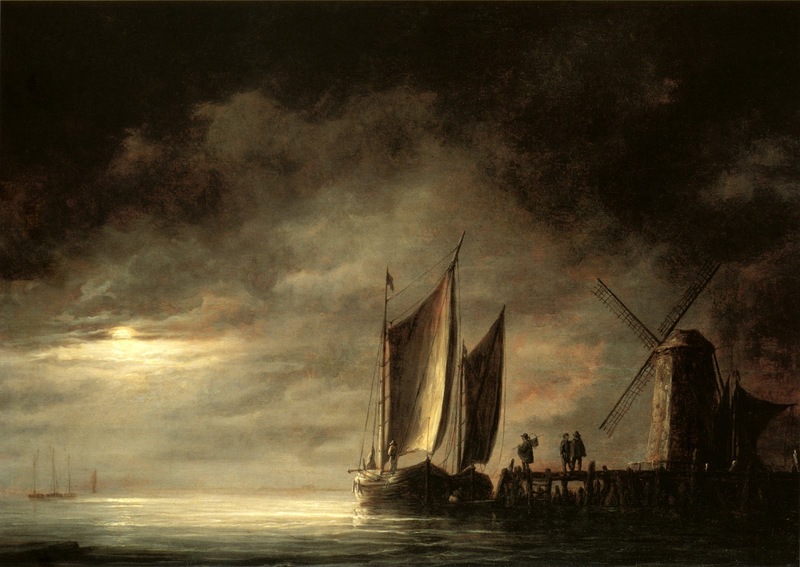 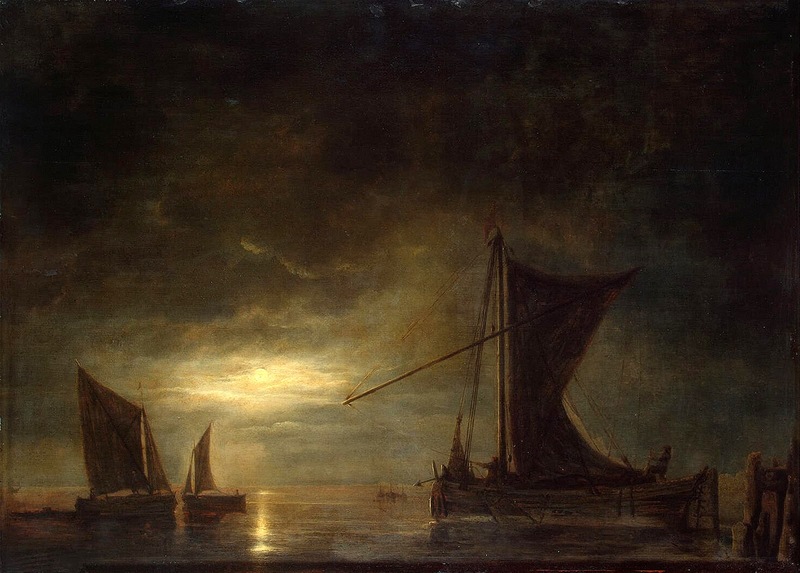 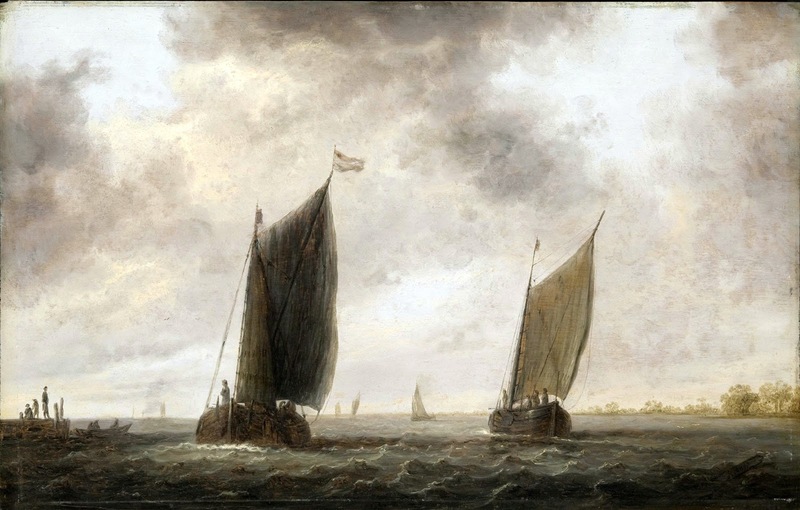 Whether he also studied under Jan van Goyen, with whom his early style has much in common, remains a subject of speculation. 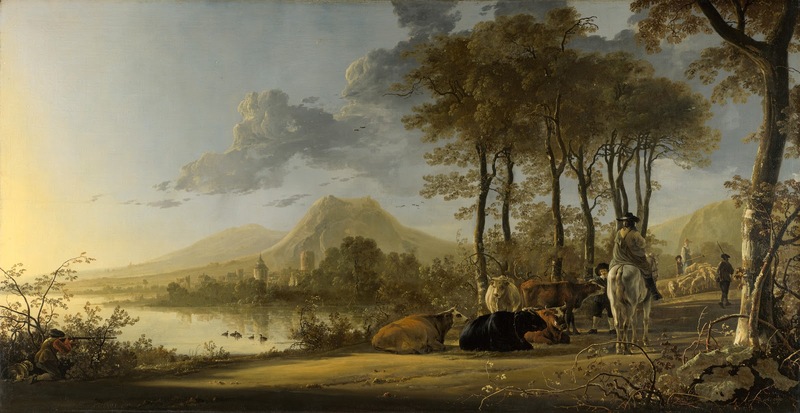 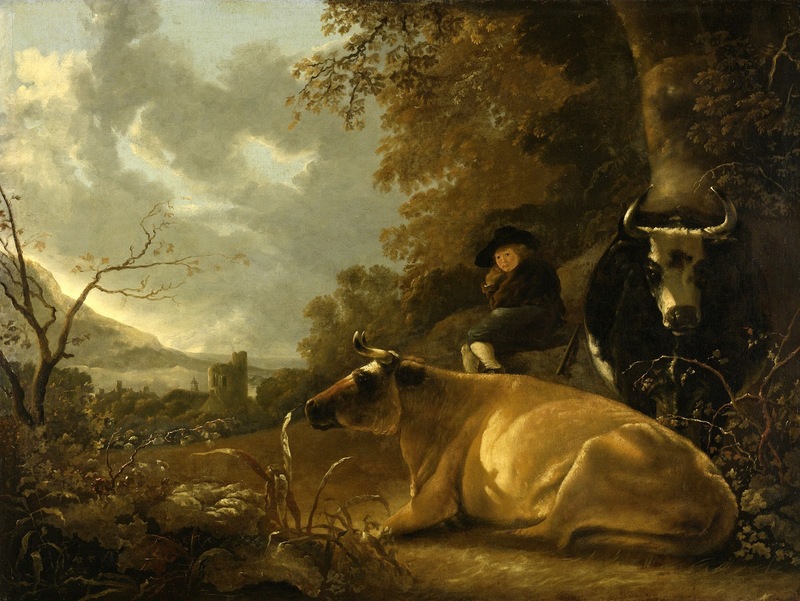 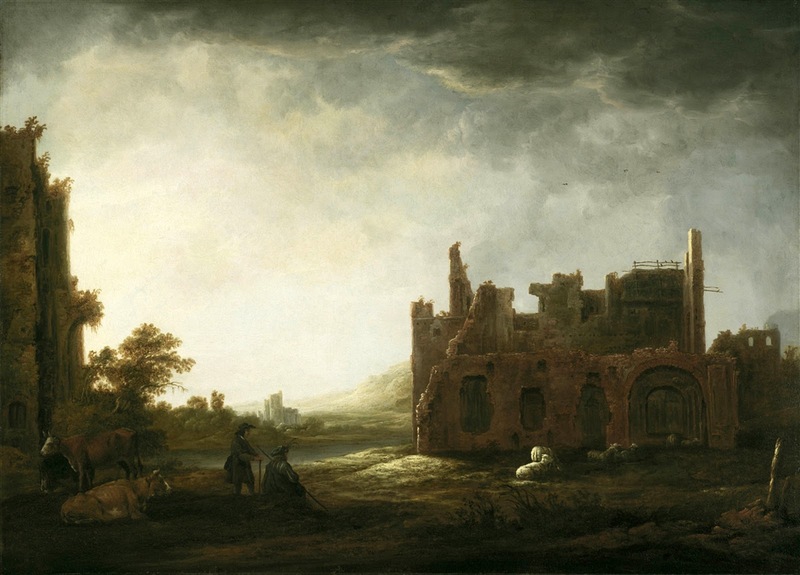 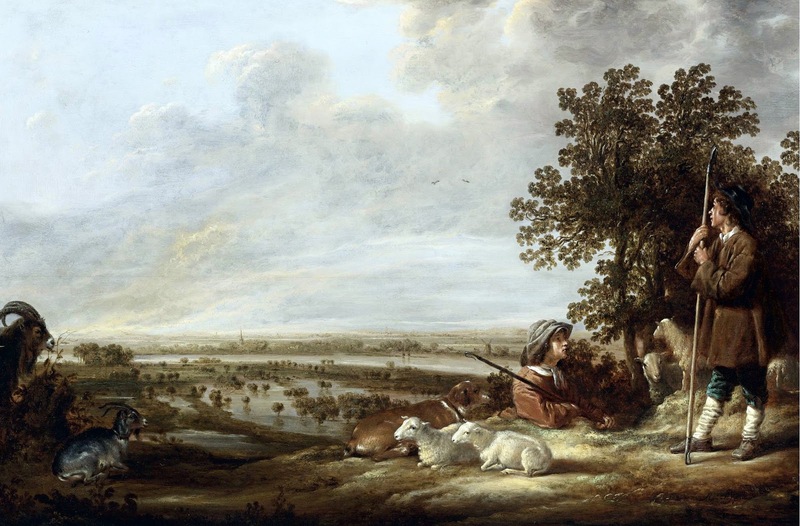 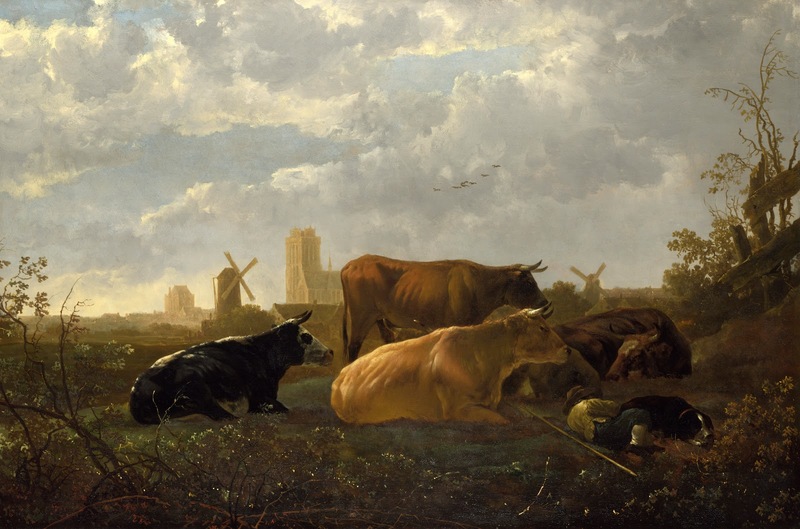 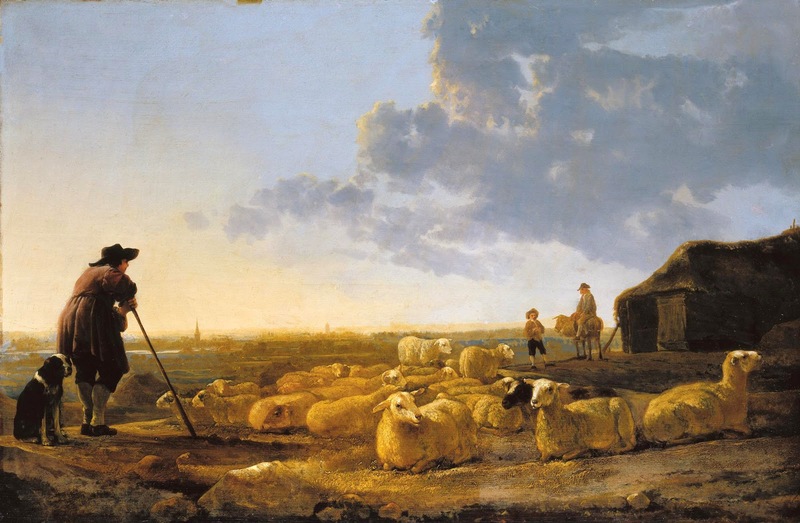 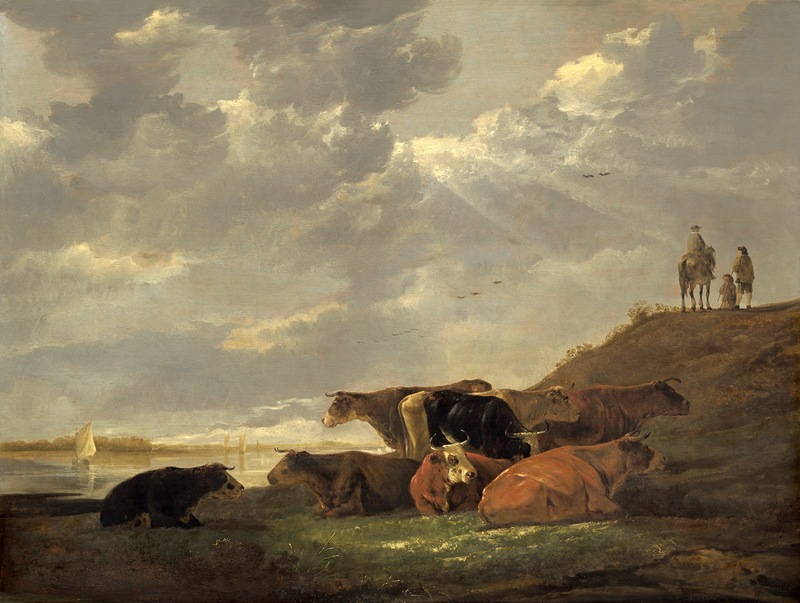 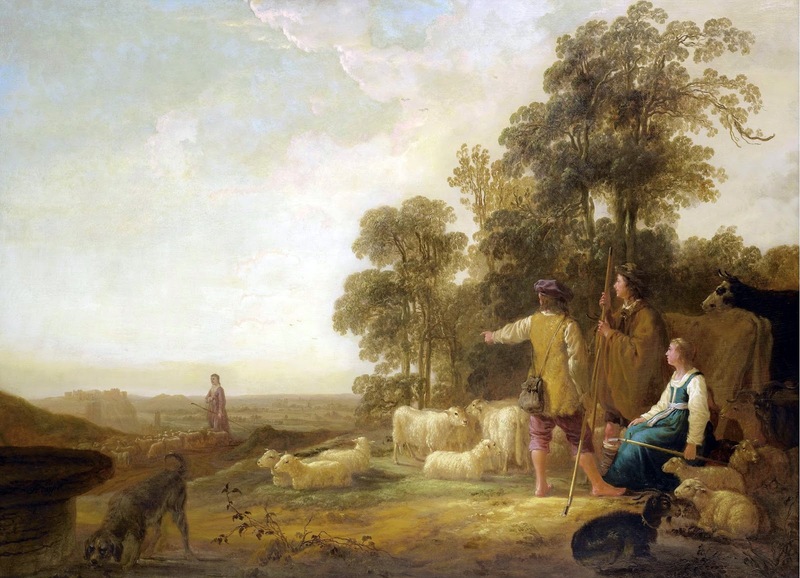 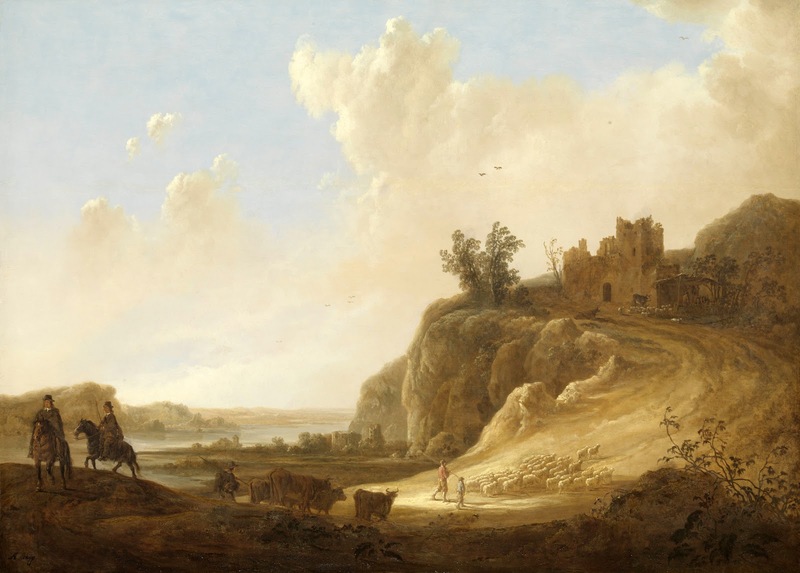 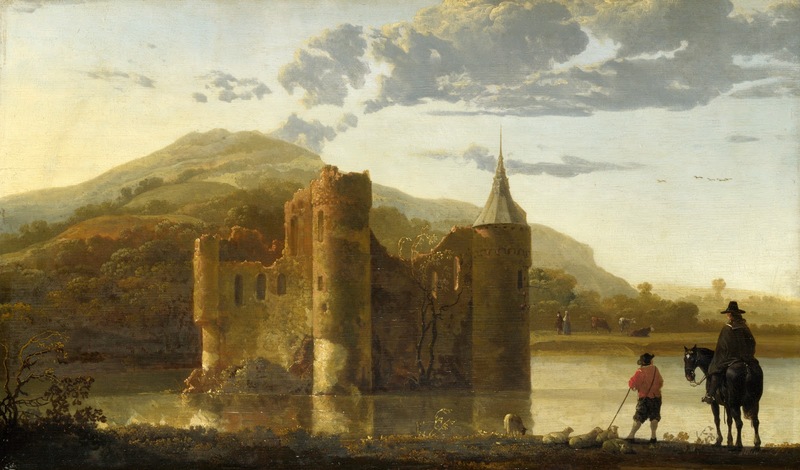 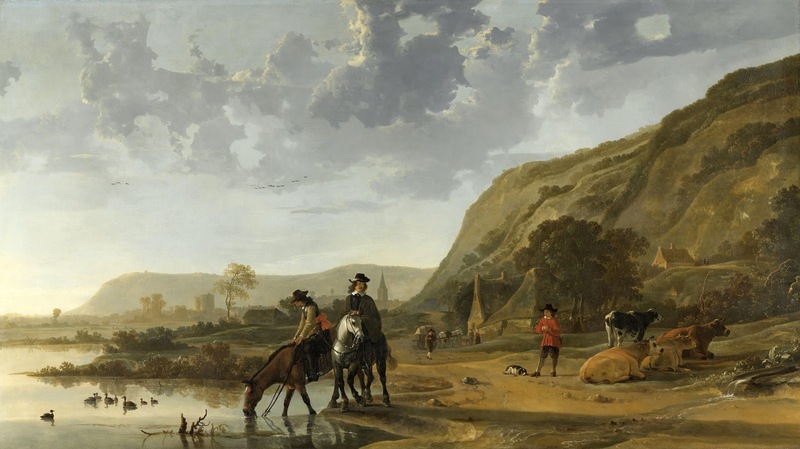 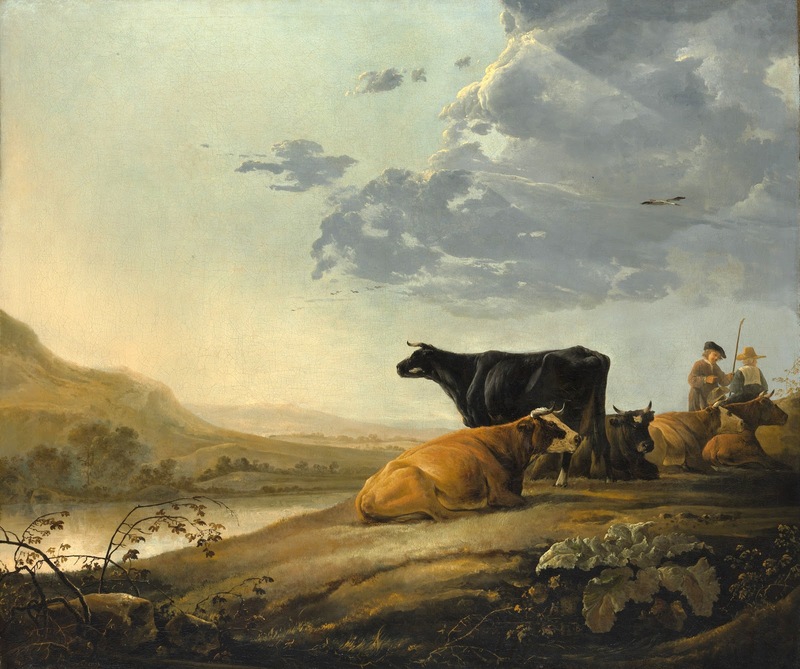 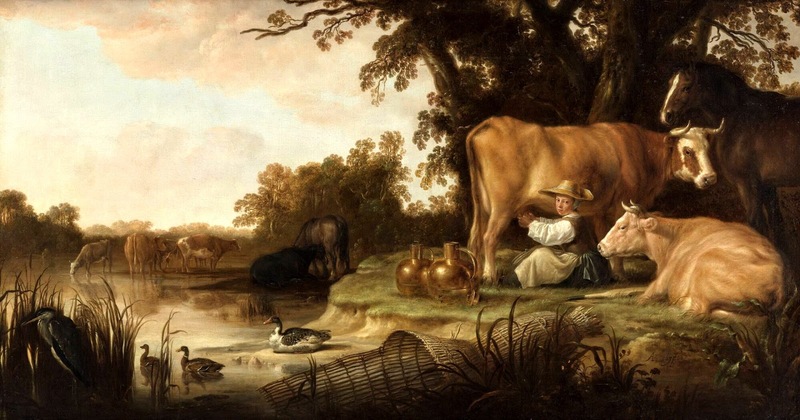 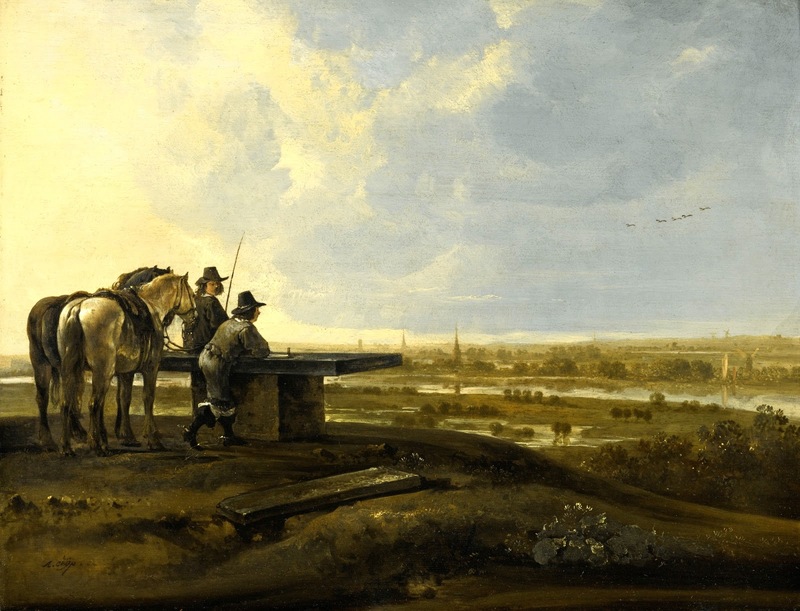 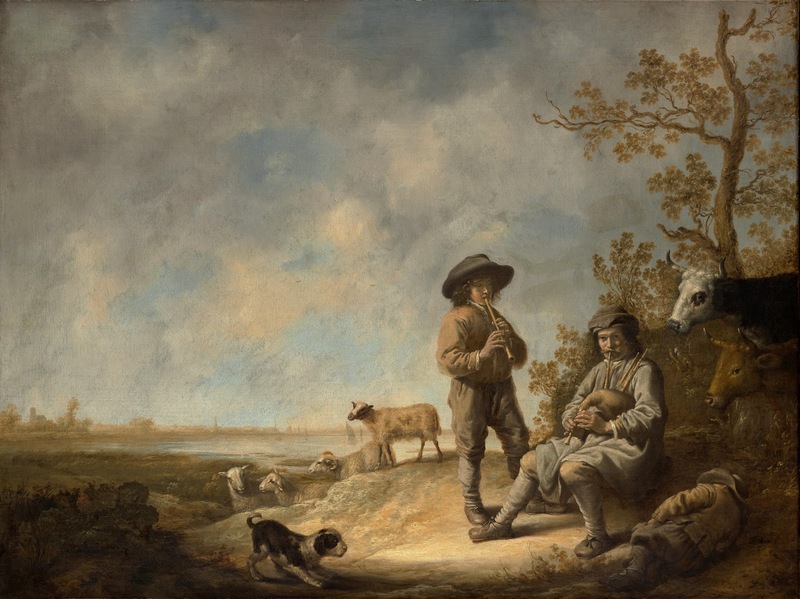 He does not appear to have ever traveled far from Dordrecht, but his pictures suggest that he knew the country around Nijmegen and that he journeyed farther up the Rhine or the Meuse, where the banks are hillier - e.g., Hilly Landscape with Cows and Shepherds (c. 1665). 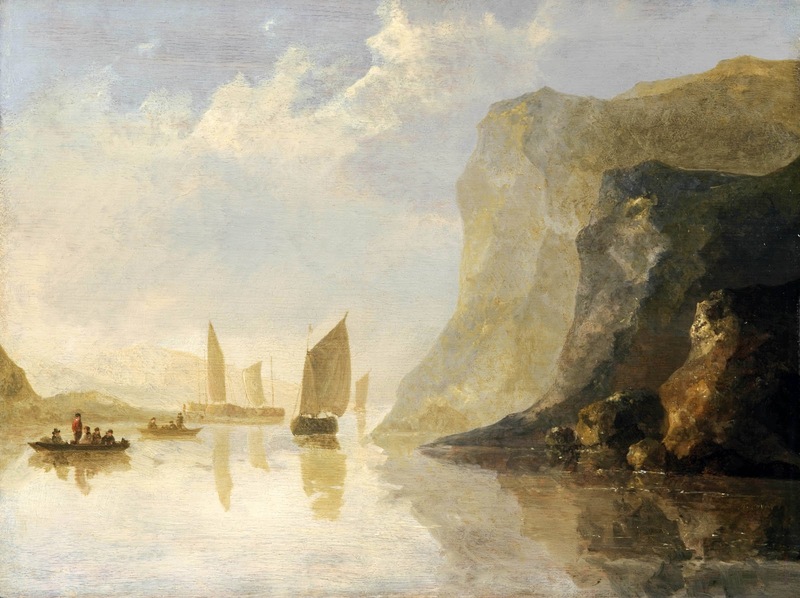 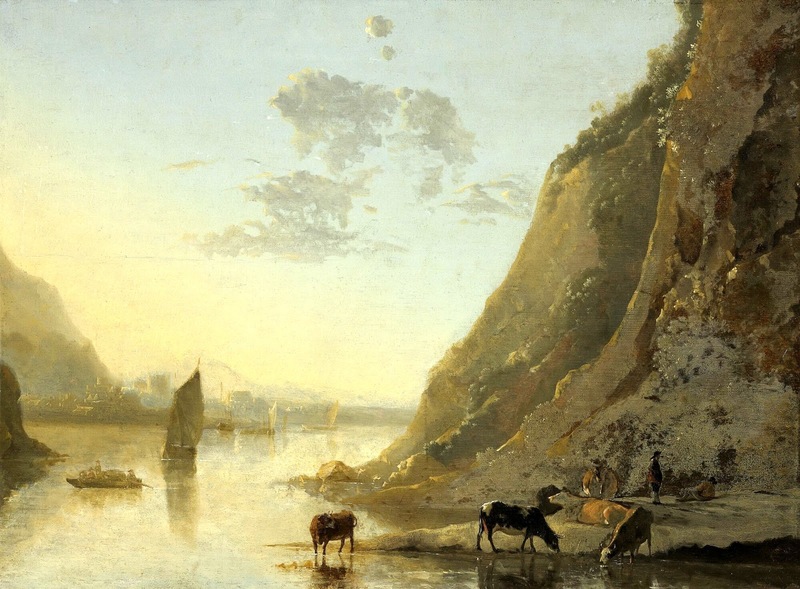 The theory that he worked in Utrecht would explain the Italianate elements in his mature style, the feeling for simple and noble form, and the warm, rich rendering of atmosphere. 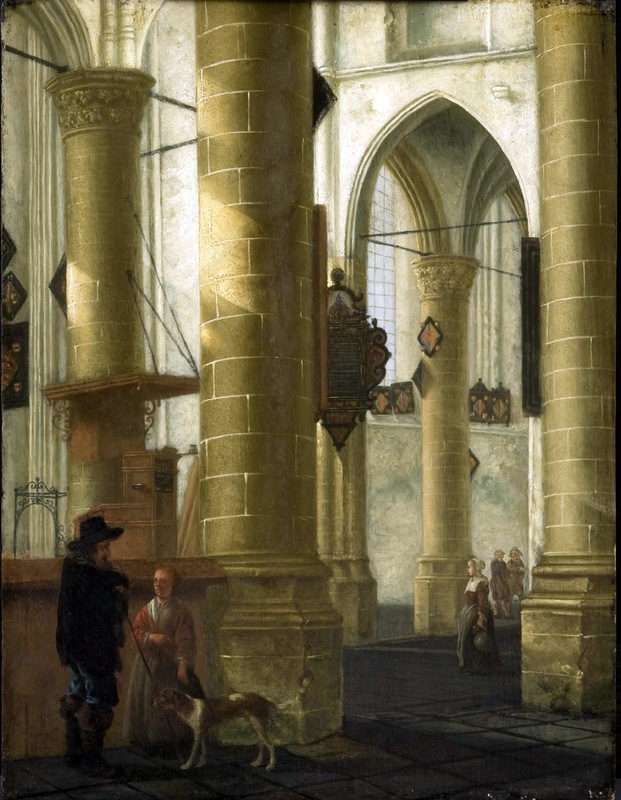 More than any other artistic centre in Holland, Utrecht looked to Italy for its stylistic nourishment. 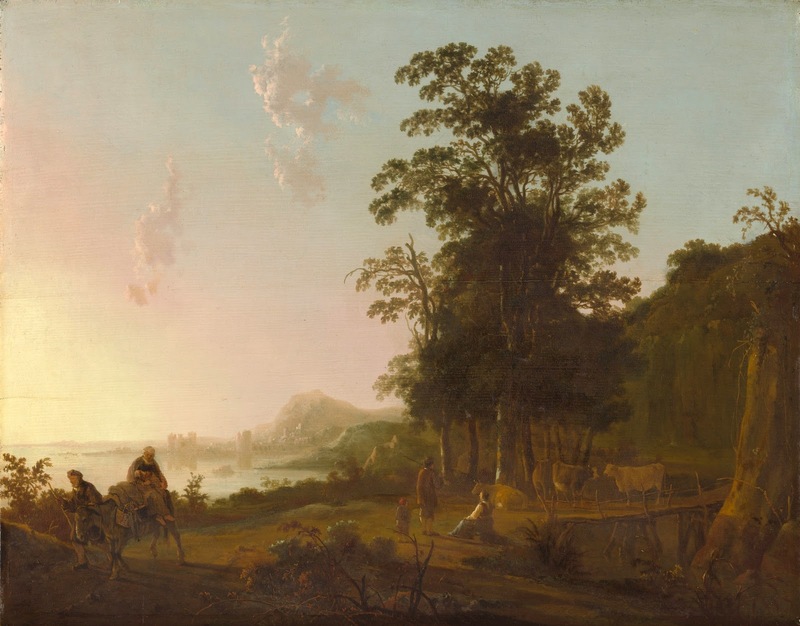 There Cuyp would have known the work of Jan Both, a direct link to the works of the great French landscapist Claude Lorrain. 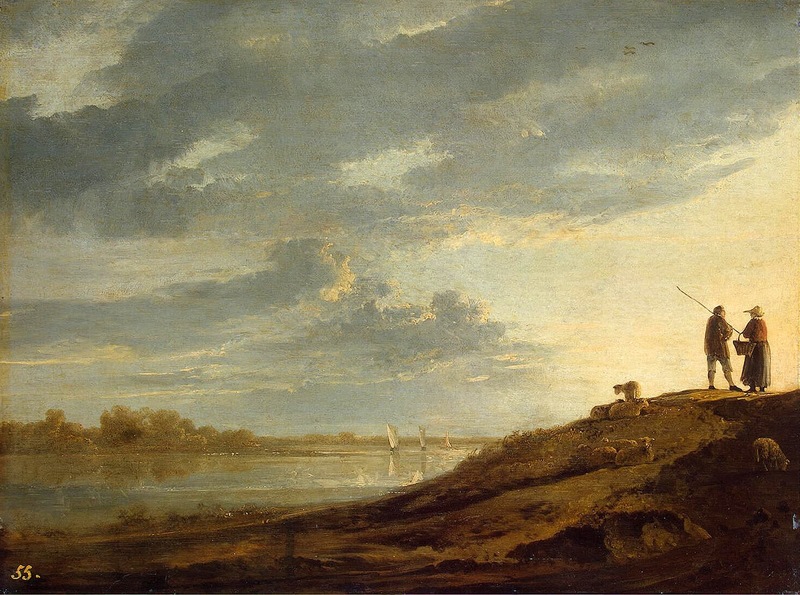 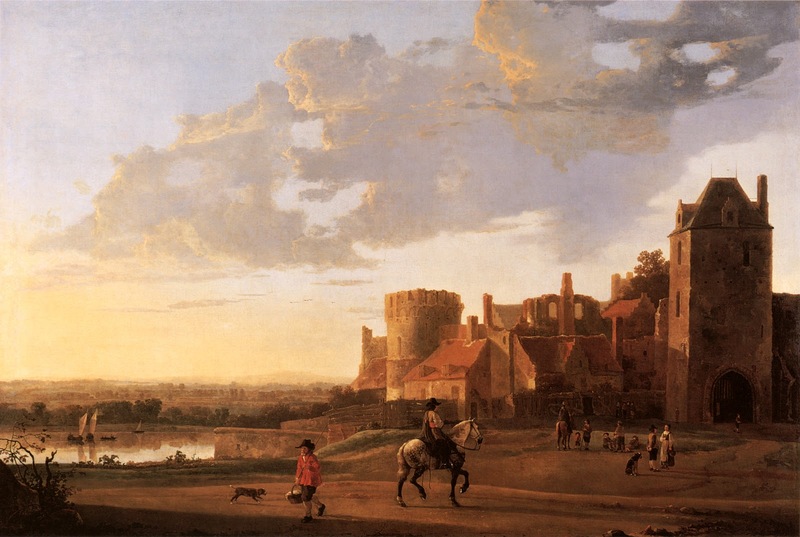 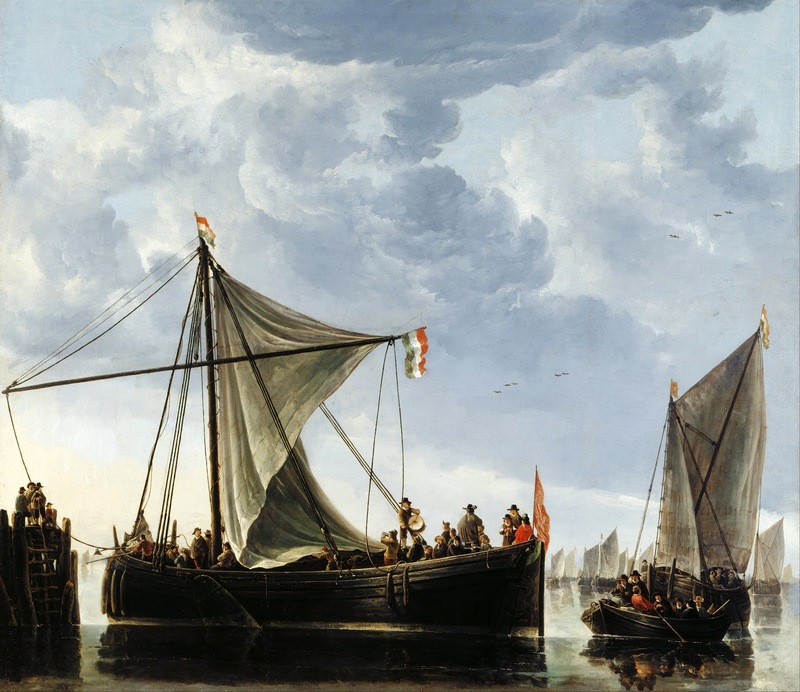 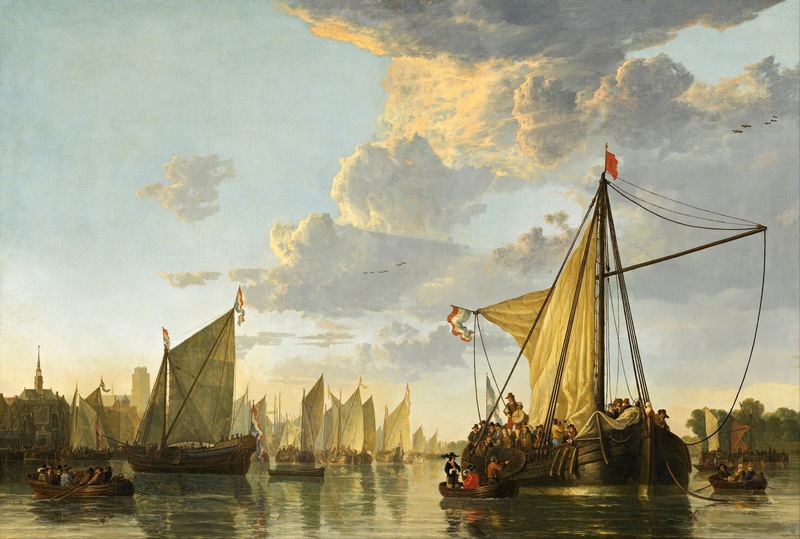 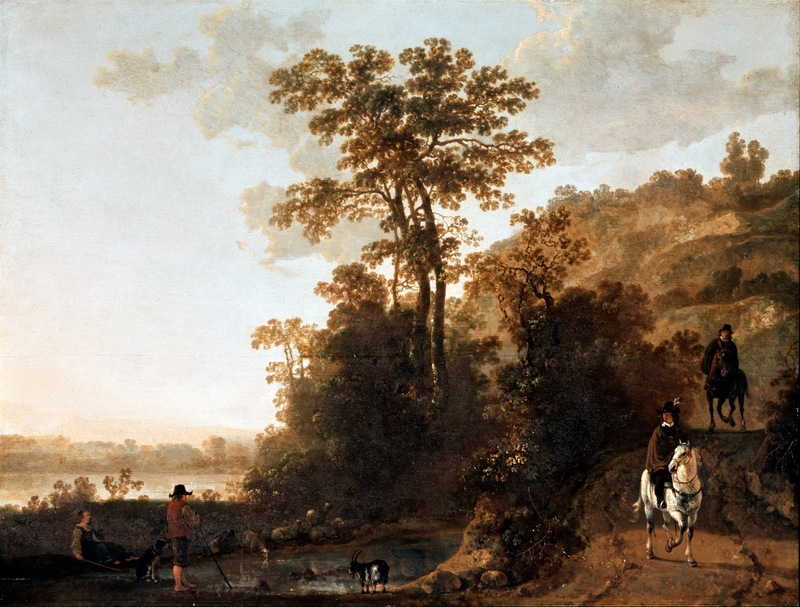 Lorrain’s indirect influence can be discerned in Cuyp’s River Scene (c. 1650). 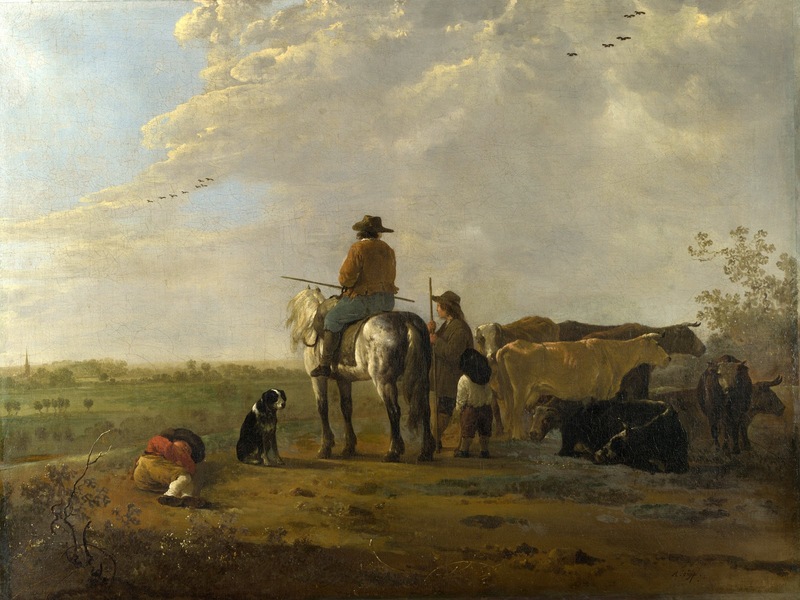 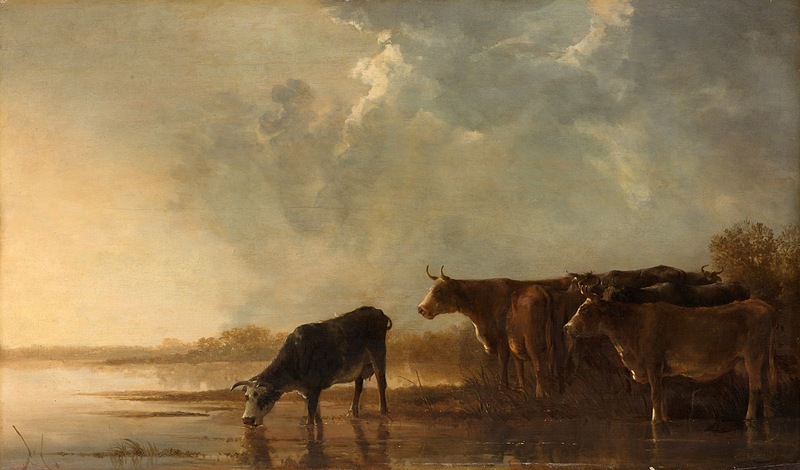 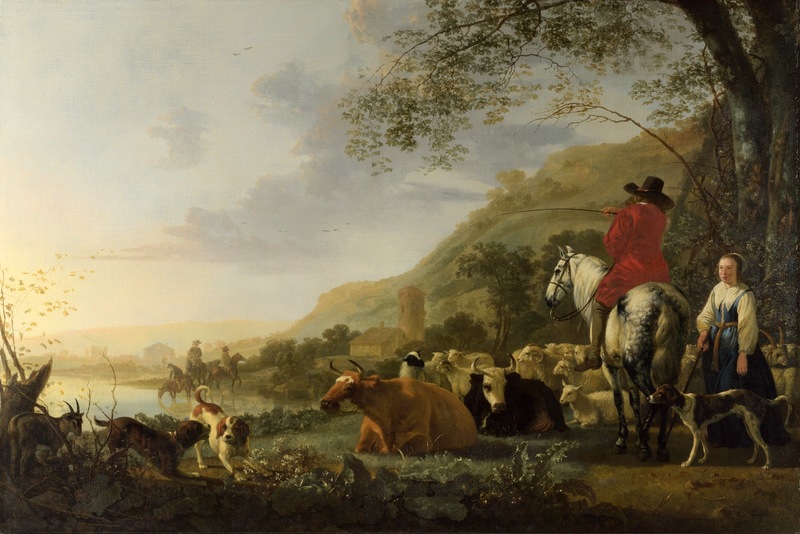 Cuyp painted some pictures of animals and birds and an occasional portrait or historical piece, but by far the most numerous and important branch of his art is the landscapes. 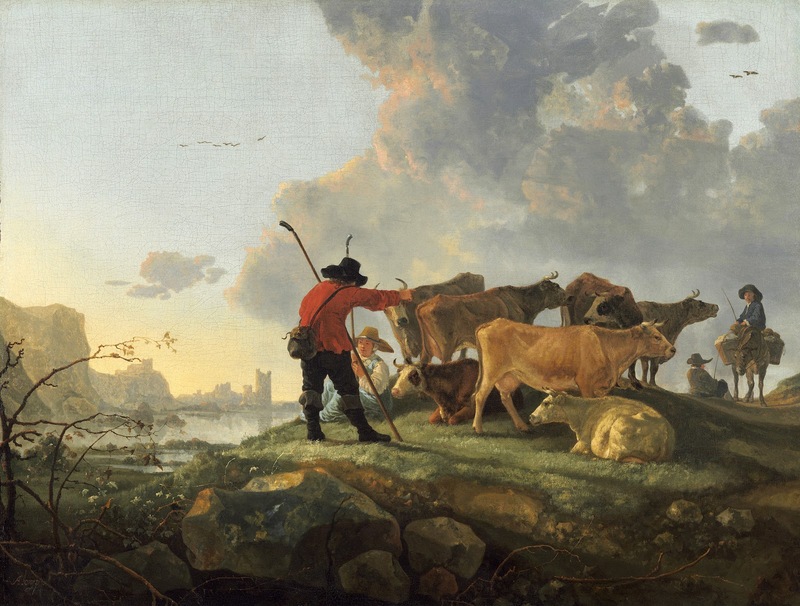 Cuyp signed many but dated few of his paintings, and it is difficult to establish a chronology of his stylistic development. 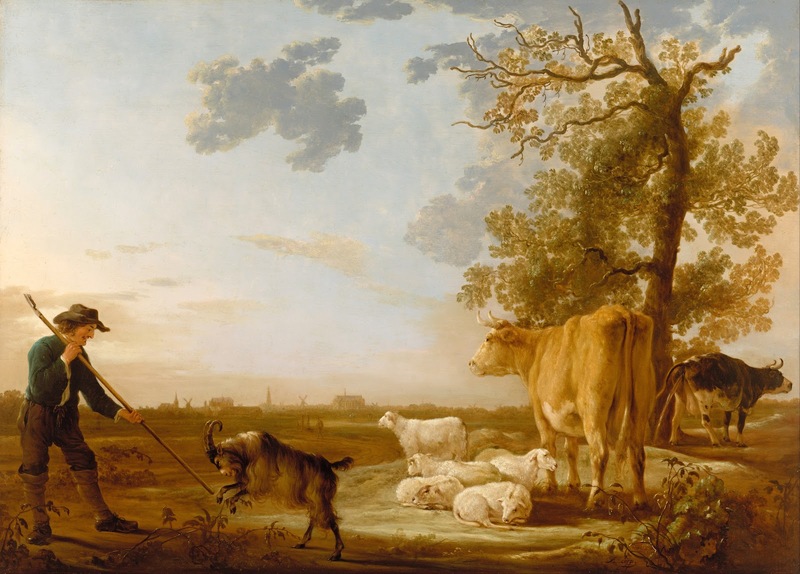 It is clear that up to the early 1640s he painted usually on a small scale, landscapes with cattle and figures, executed with a firm but flowing touch. 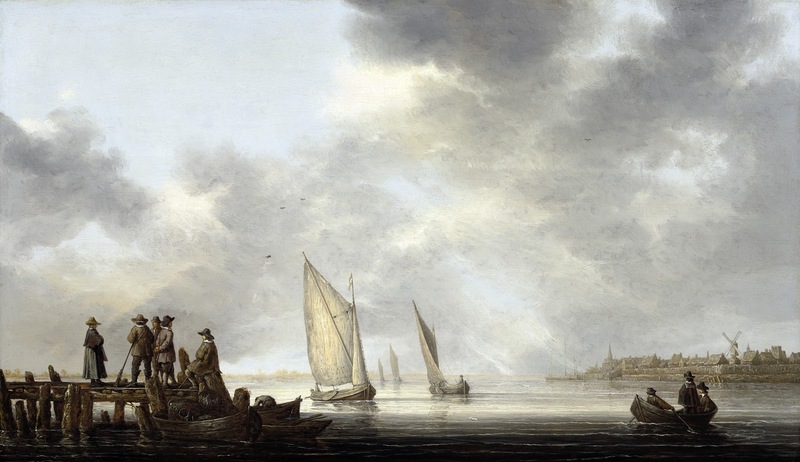 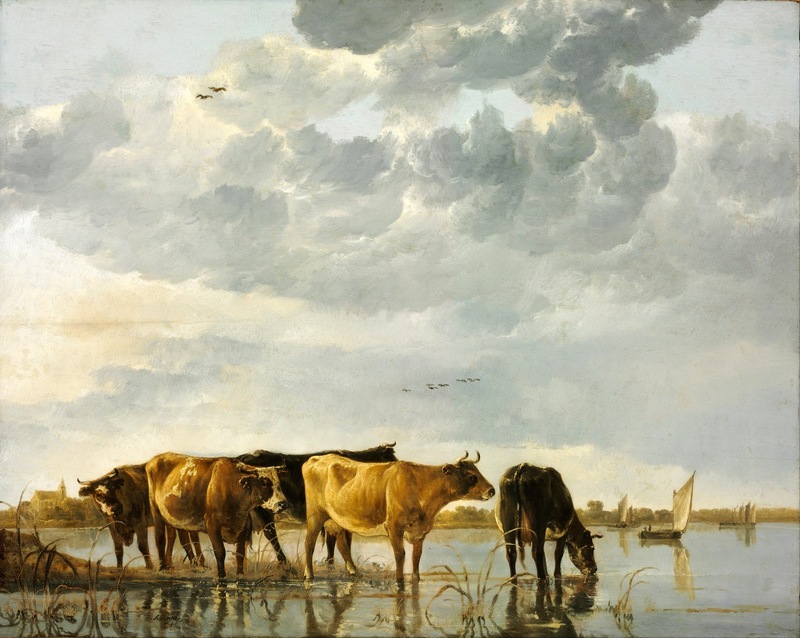 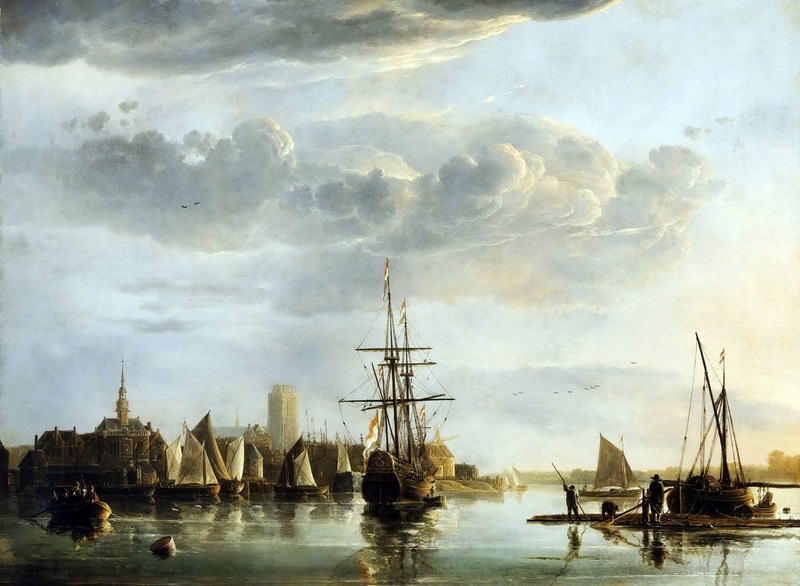 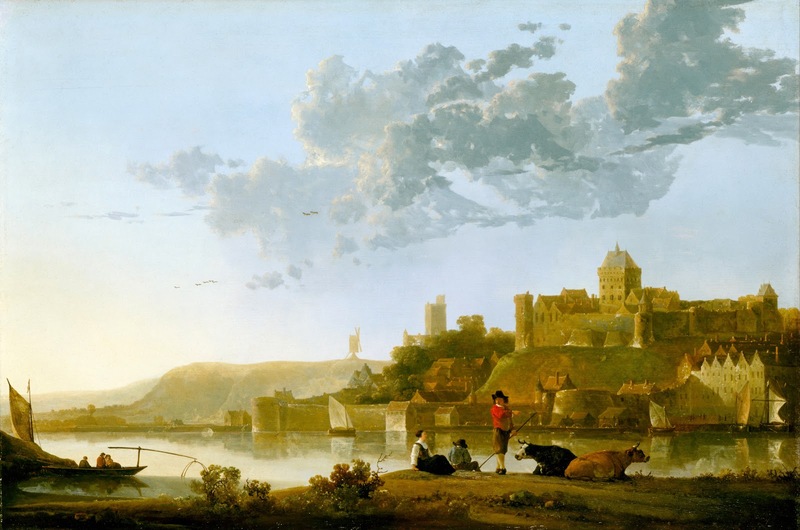 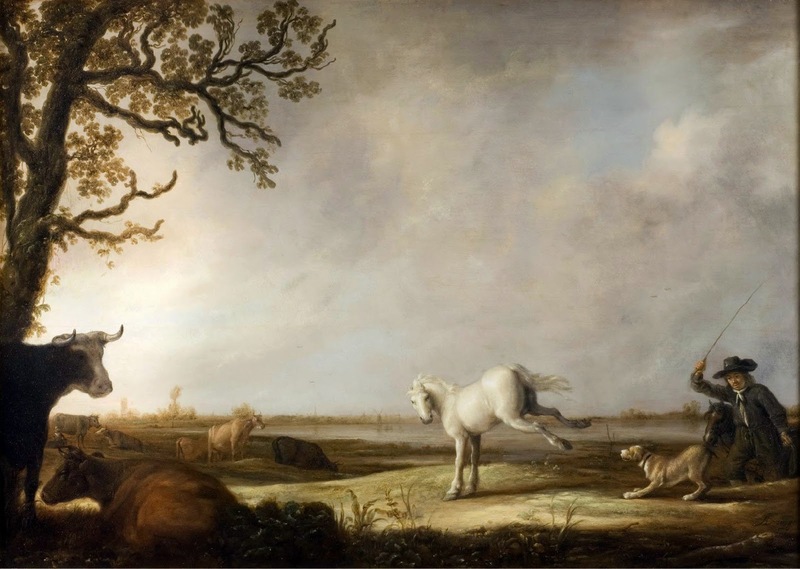 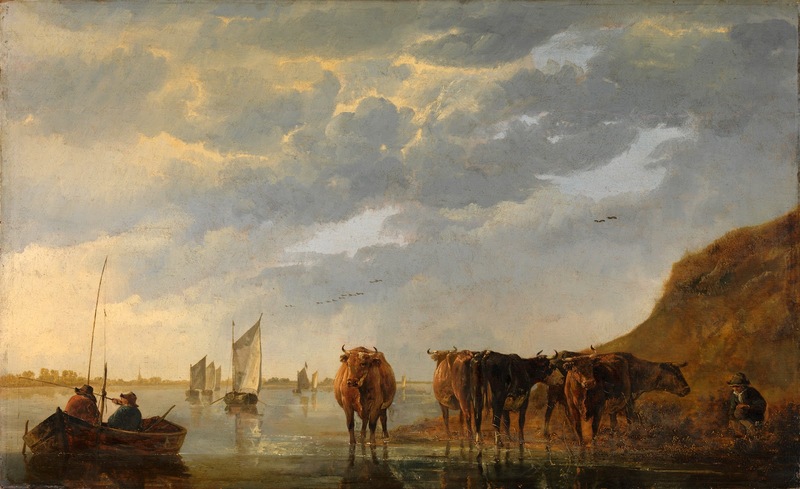 To the later 1640s and 1650s belong most of his best-known works, the serene views of the banks of the Maas and Waal near Dordrecht, with shipping on calm waters - e.g., The Maas at Dordrecht - or resting cattle silhouetted against an evening sky - e.g., Cattle - and the bolder Rhenish landscapes, with groups of horsemen or peasants - e.g., Evening Landscape with Horsemen and Shepherds. 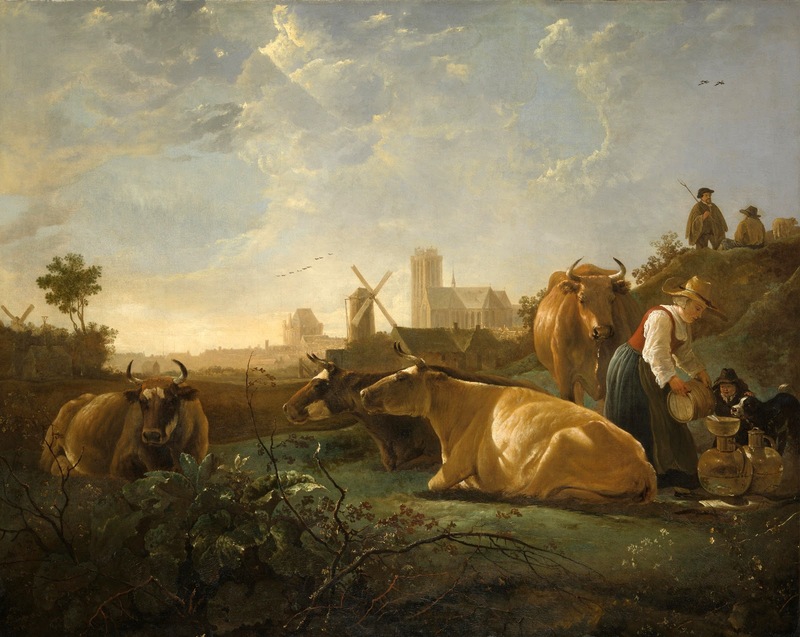 Whether the composition is simple or expansive, he bathes these subjects in a subtle glow of light, creating a poetic environment. 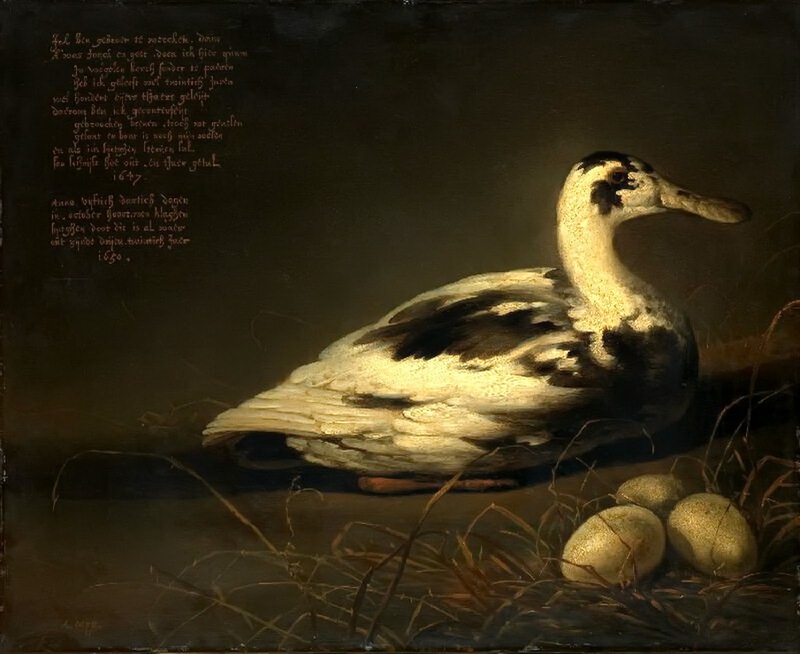 Some larger and more-artificial compositions, in which the spirit of delight in simple nature becomes diluted, probably belong to the later years of his activity in the 1660s. 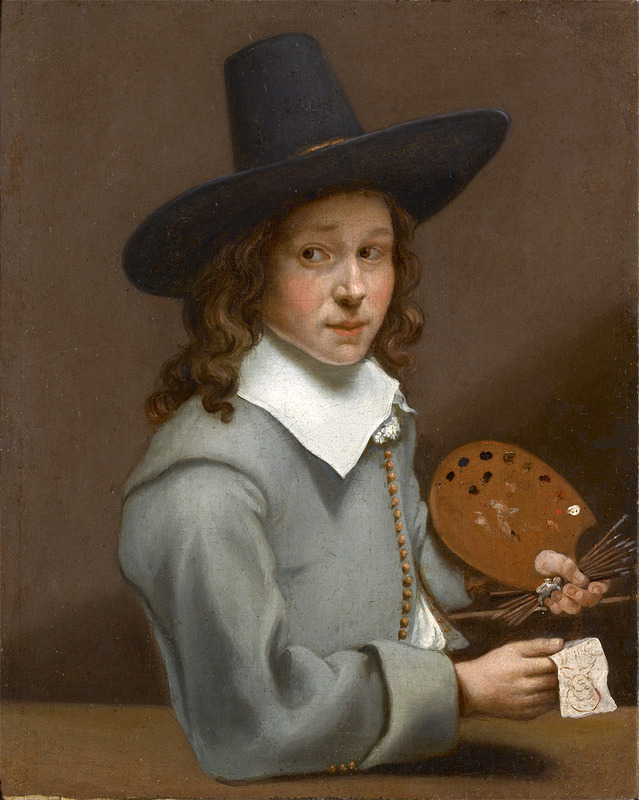 During the last 20 years of his life, he painted little. 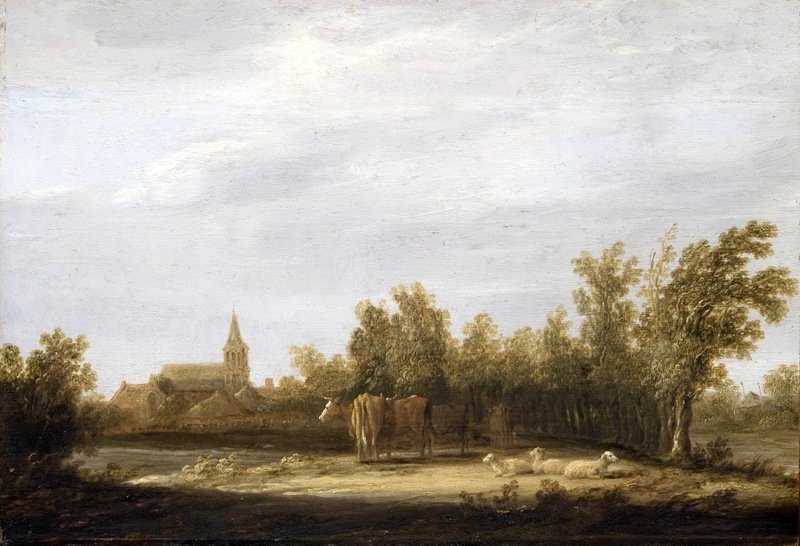 | © Encyclopædia Britannica, Inc.
Aelbert Jacobszoon Cuyp (o Albert; /'a:ɫbərt 'ja:kɔpszoˑʷn kœʏ̯p/) (Dordrecht, ottobre 1620 – Dordrecht, 15 novembre 1691) è stato un pittore Olandese**. 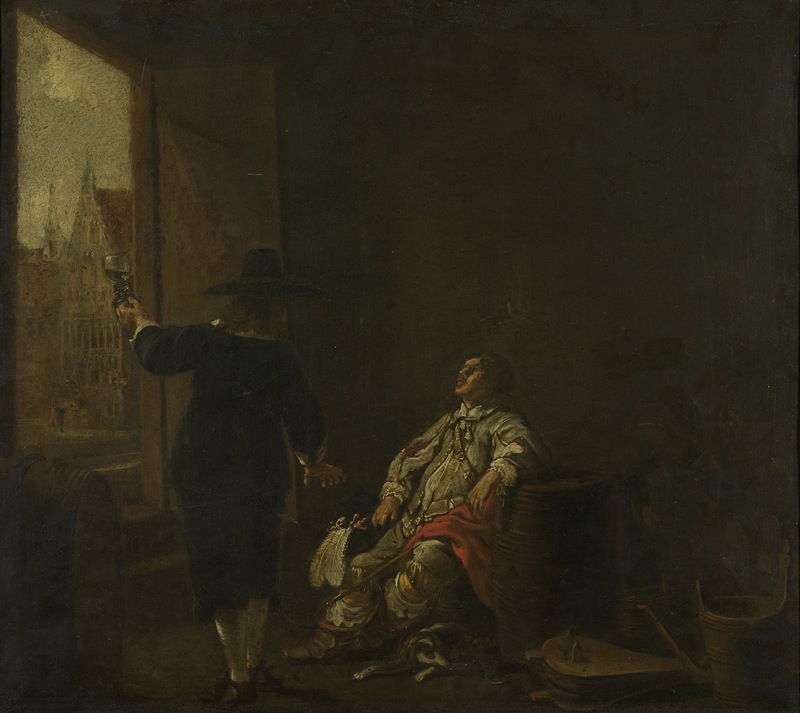 Fu l'unico figlio di Jacob Cuyp, anch'egli un pittore di paesaggi. 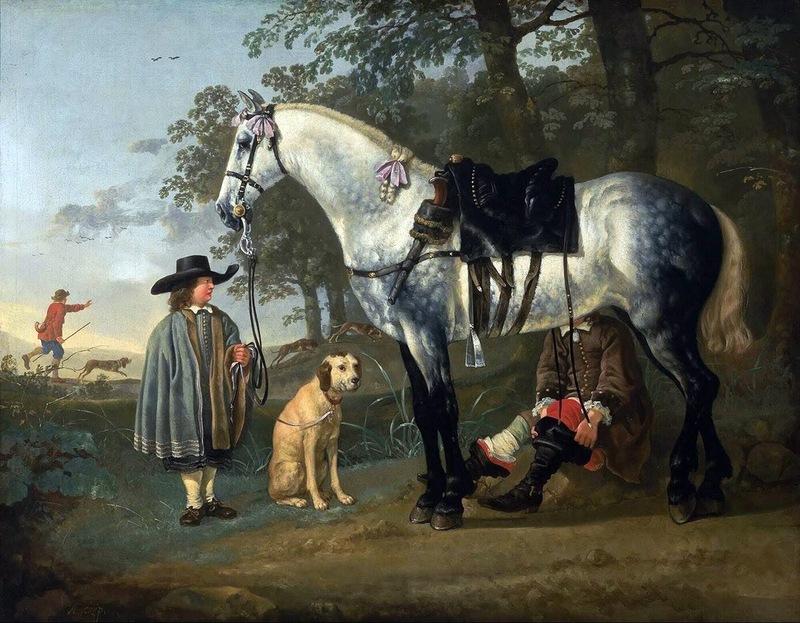 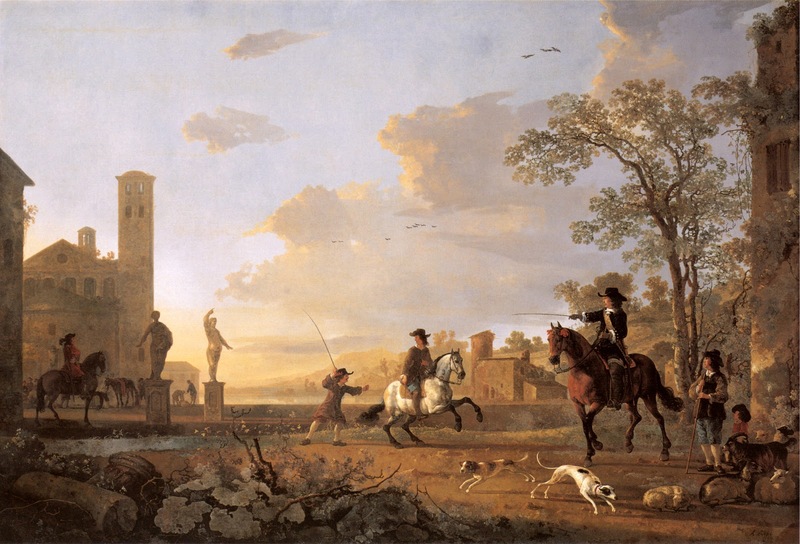 Aelbert Cuyp sviluppò un suo stile personale intorno al 1650. 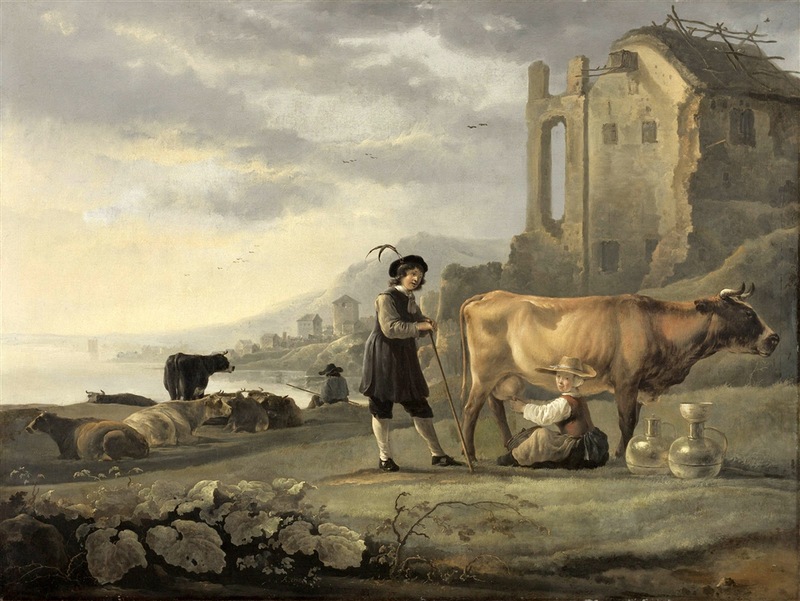 È famoso per aver dipinto paesaggi con figure e animali, temi sacri, storici e mitologici. 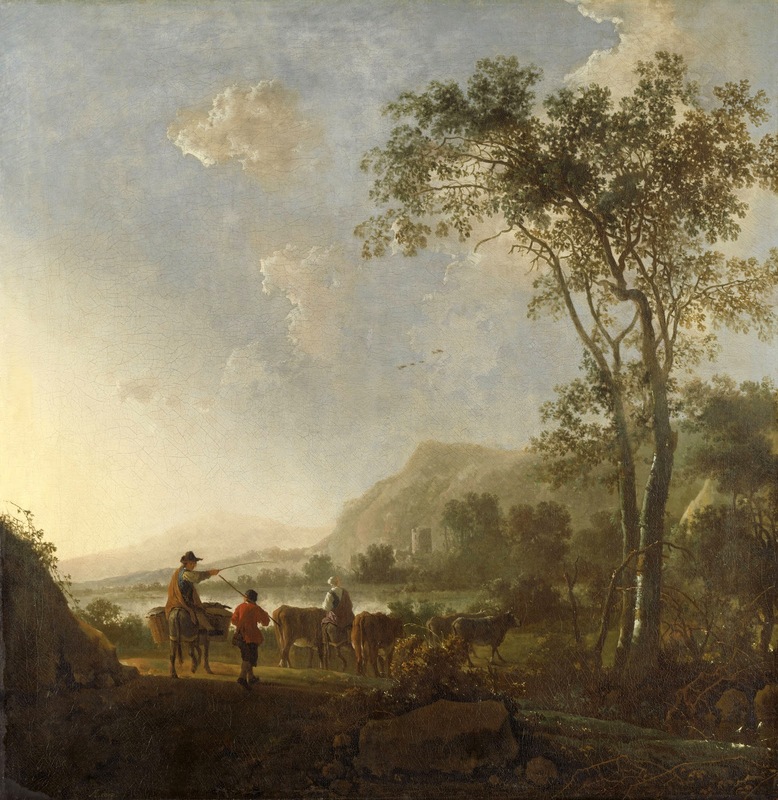 I suoi paesaggi sono immersi in una luce solare tipica del mediterraneo anche se Cuyp non ci andò mai. 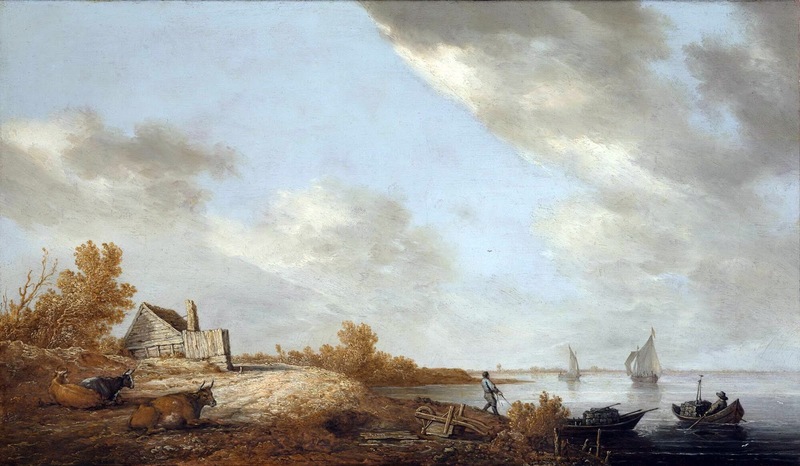 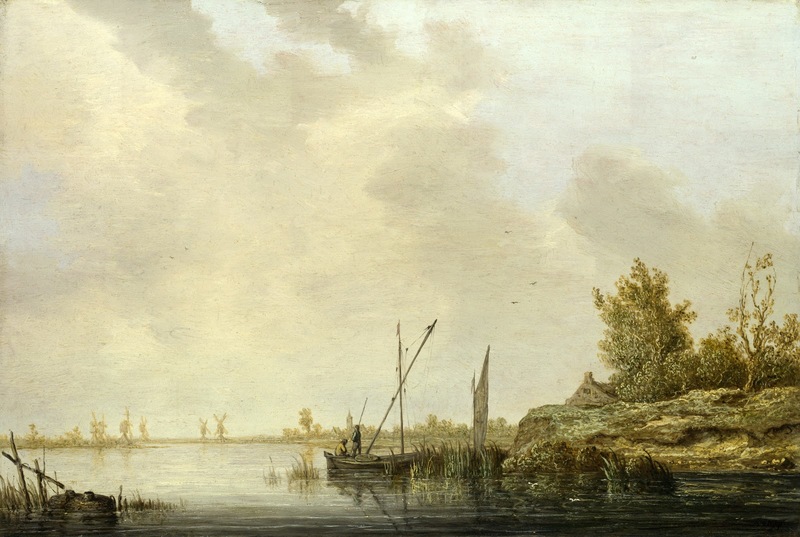 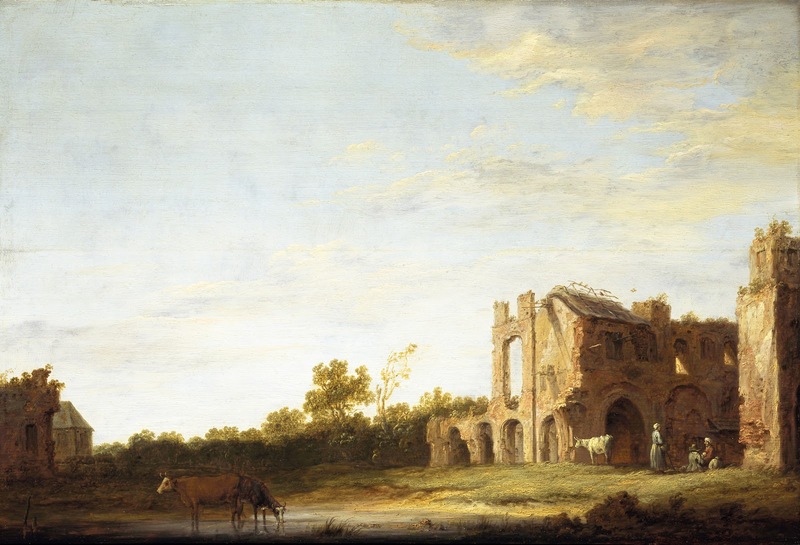 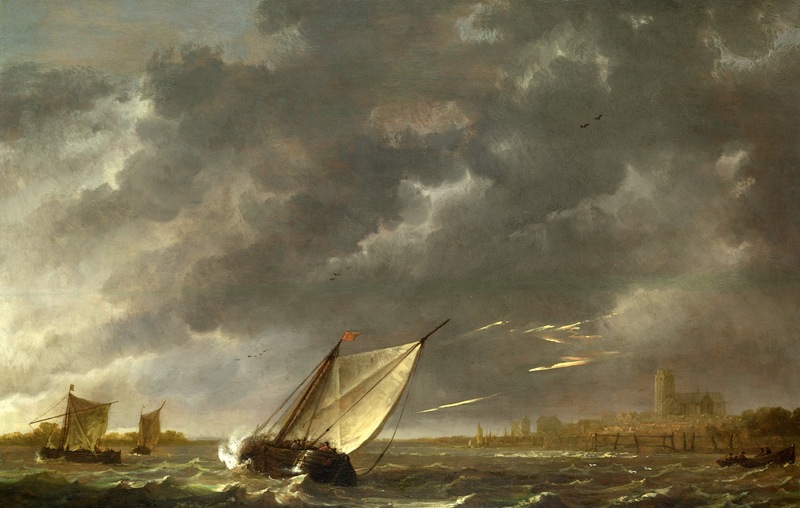 La pittura di Aelbert Cuyp fu influenzata da Salomon van Ruysdael, Jan van Goyen, dal quale derivò le tonalità basse, le tinte forti e la struttura dei cieli, Jan Both e Claude Lorrain. 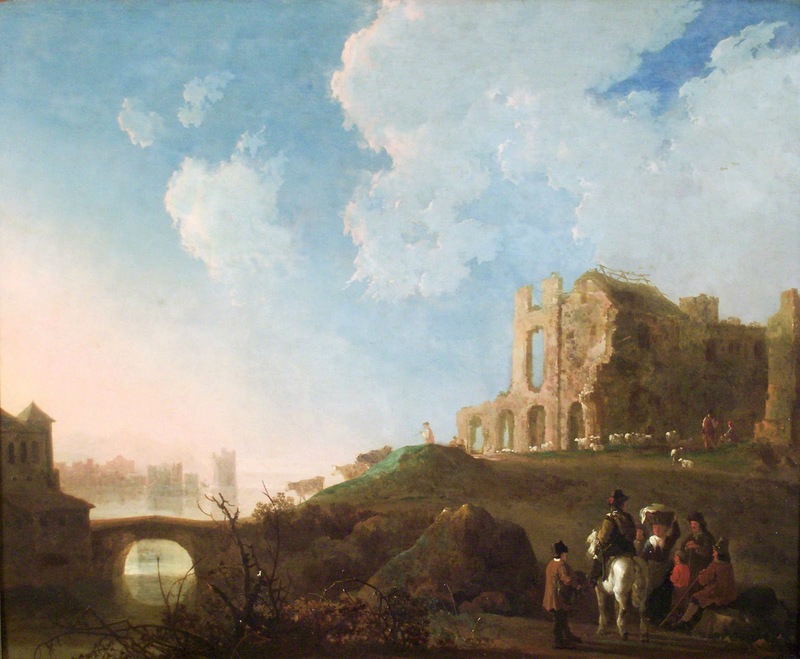 La maggior parte delle sue opere non sono datate.